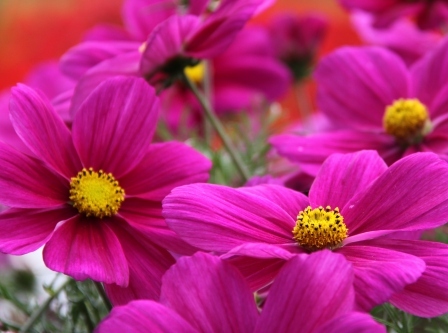 Cosmos are Half Hardy Annuals… that means they won’t survive the winter. However they will flower right up until the first frosts. If you collect the seed when it’s ripe (anytime now with this lovely warm weather) then you can keep it over winter ready for sowing next spring. See How to Collect and Store Seeds for more info. 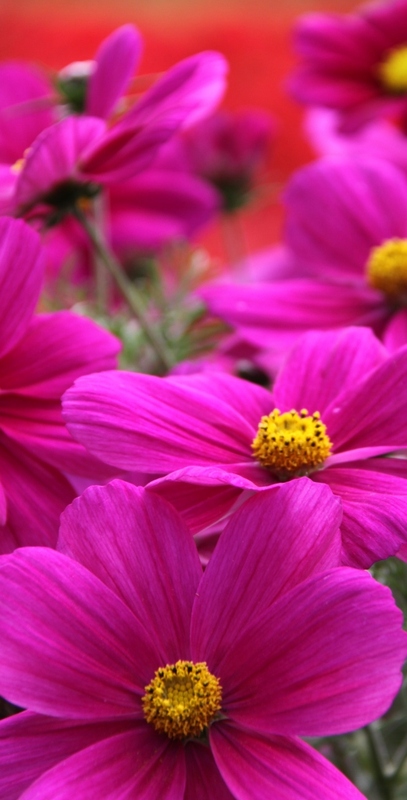 Cosmos are easy to grow so are perfect for new gardeners and children to try. This garden had the shorter Cosmos plants probably about 2′ feet or 60 cm tall which makes them perfect for bedding schemes, growing in pots and wind swept gardens. I usually grow taller varieties. I love the deep pink flowers and I also grow lots of white ones too. My favourite way to use Cosmos is to plant several (mixed colours) in a large pot then use to fill any gaps in the Summer Border. If these are just a touch too bright for you there are some lovely pastel shades instead. No sunglasses required for these beauties! I grew Cosmos for the first time this year and have not been disappointed. The white ones in particular have been stunning both in the borders and in pots. I certainly agree with your recommendation.